Frustrated with the media’s neglect of economic issues that matter to the working class, the senator tells The Nation how he’ll use live-streaming to force the issue. Now he’s doing something to tip the balance of the popular discourse away from the agendas of the super-rich and toward the real-life concerns of working-class Americans. Something big. On Monday, from 7 to 8:30 pm ET, he will host a live-streamed town-hall meeting on “Inequality in America: The Rise of Oligarchy and Collapse of the Middle Class.” With Massachusetts Senator Elizabeth Warren, filmmaker Michael Moore, economist Darrick Hamilton, and others, Sanders will lead a discussion about the “growing power of corporate interests and how we can build economy that works for all Americans.” Livestreamed on Facebook, Twitter, and YouTube by Sanders, Warren, Moore, The Guardian, NowThis, The Young Turks, and Act.tv, the initiative will reach social-media sites with a combined following of close to 50 million Americans. Sanders spoke with The Nation about what he hopes to accomplish. The Nation: You say there are two fundamental issues with inequality. What’s the first? Sanders: The first one is that this country is moving into oligarchy. The three wealthiest people in this country own more wealth than the bottom half of American society. The top one-10th of one percent now owns as much wealth as the bottom 90 percent. And then, politically, what we have seen since the Citizens United decision (by the US Supreme Court in 2010) is billionaires like the Koch brothers and a few of their friends pouring hundreds and millions of dollars into the political process to elect candidates who represent the wealthy and the powerful. That is an issue of huge consequence to the future of America—in terms of the economic life of this country and the collapse of the middle class, and a political system which is being corrupted by big money and Citizens United. And the second issue has to do with how the first is covered? The second issue deals with the fact that we have a corporate media, which is not as Donald Trump defines it “fake news.” That’s not the issue. It’s not that you have people on CNN, or writing for The New York Times, who are deliberately lying or trying to destroy politicians—that’s not the case. Everyday there are very good and important articles that appear in The Washington Post and The New York Times, on CBS News and everywhere else. The problem is that, to a very significant degree, corporate media ignores, or pays very little attention, to the most important issues facing working people. That is the problem with corporate media today. If you look at just the issue I described to you—the movement in this country toward oligarchy—you will find very, very little discussion about that. Stormy Daniels will get 10 times more print and video coverage than will the movement toward oligarchy in this country. You will see very little discussion about poverty in this country. “Poverty” is just not a word that is used on television very often. And you think you can do something about that. What we are trying to do now is pretty revolutionary.… We have co-sponsorship on this town meeting that includes, obviously our Facebook, which has 7.5 million followers, Elizabeth Warren with close to 3.5 million, Michael Moore with 2.2 million, The Guardian with 7.9 million, Young Turks with 4 or 5 million, and many more pages that will be sharing the live stream. There probably is duplication, but its absolutely fair to say tens of millions. Last time [in January] when we did the Medicare-for-All/Single-Payer town meeting, we ended up having 1 million live viewers and then a million people came on board later. So it’s a total of 2 million. Our hope is that this time we will do better than that…. This is revolutionary in terms of media. What this means is that there is now extraordinary potential to get issues out: whether it is the health-care crisis and Medicare-for-All; whether it is the collapse of the middle class and the movement toward oligarchy; or maybe next time we’ll do something on criminal justice or guns or immigration or whatever it may be. We do now have the possibility through live-streaming to discuss serious issues with serious panelists that will never be discussed—or very rarely be discussed—on the corporate media. This, I think, is transformational from a media perspective. I am very, very excited about this. If it continues to do as well, if the viewing audience continues to be as high as I think it will be, we’ll just continue doing programming like this on issues that go into a depth that the corporate media will not do. This question of corporate media’s coverage of inequality, or the lack thereof, had been a concern of yours for a long time. But your concern hasn’t just been with the patterns of coverage by traditional medial; it has been with the issue that those patterns of coverage create results by putting some issues on the table while taking other issues off. Absolutely, absolutely. Now, as I’ve said before, the issue is not fake news. I don’t think The New York Times lies everyday or is trying to attack me or anybody else. That is not the issue. The issue is just what you talked about. Somebody has to determine every morning what the news of the day is. And somebody says that we need three days of coverage on some Trump aide getting kicked out of the White House—day after day after day. Do you think people in Kansas, or in Vermont, or California are sitting up and worrying about that? It’s important. I’m not suggesting that these things should not be covered. But there are other issues that should also be covered. Today there will be many, many, many hundreds of people dying in this country because they can’t afford the prescriptions that they need or the health care that they need. That happens every day, and that’s just not a story in our media. There are children today who are sleeping in the back seat of cars because their mom does not have an apartment that she can afford. That happens today, but it’s not a story. In other words, somebody has to determine what is most important and what is not most important. And the issues of oligarchy and who controls America, the unnecessary misery that millions of Americans are living in because they don’t have any income, what it means to people’s lives that they’re making eight, nine, 10 bucks an hour working 50 hours a week and unable to afford their bills, those issues are not treated as if they’re important. The same is true with the fact that you have millions of senior citizens living on $12,000, $13,000 a year, the fact that the Koch brothers will spend $400 million to influence our elections, the fact that climate change is threatening the future of the planet. So what I want to do is begin to move forward presenting our perspective on what we think are the most important issues facing America. 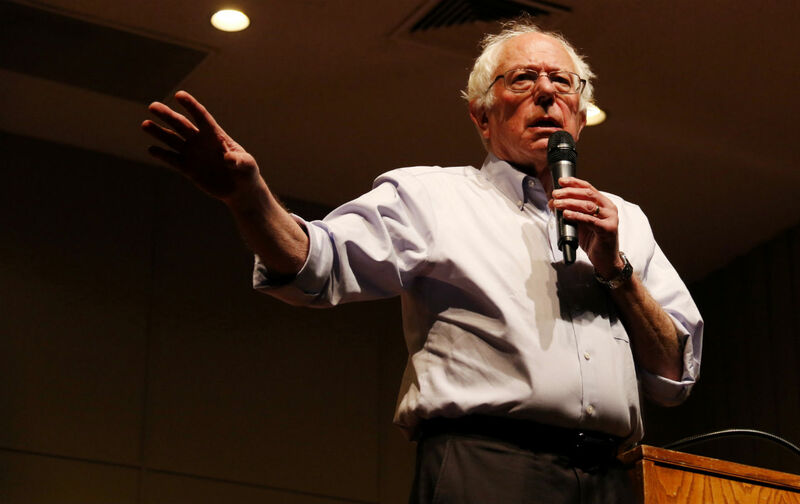 The first [live-streamed town hall that Sanders did] was on Medicare for All: We’ve got to join the rest of the industrialized world and guarantee health care as a right—not a radical idea. And the second one is the issue of what is going on in the economy for the middle class, and what does it mean when you have a small number of billionaires controlling the economic and political life of the country. There has never been a television program like this. If we get a large viewing audience, as I think we will, we will continue doing this. You’ve had a history of using new technology, new technologies, to try and reframe the debate. So this is not a new thing for you. You’re absolutely right. As you well know, I am somewhat of a technology Luddite. But what I do recognize is that this technology is enormously important and we should utilize every new technology that we can find in order to communicate with the American people about the important issues that are facing them. And it turns out that live-streaming is revolutionary. It means that somebody now can turn on their cell phone and produce something that goes out to many millions of people. So that is the new technology that we intend to take significant advantage of.